With so many people using Tablets, smartphones, Gaming systems and other high end wireless devices for business or personal use at home, you will need a strong router in order to run it all. When it comes to choosing a router there are many so many to choose from, but the Belkin N750 DB Wireless Dual Band router made for Gaming is an excellent choice. This router has stylish oval shape, rounded at the edges somewhat like a UFO, sleek and shiny look to it Compared too many of the routers that are available, won’t look out of place in your living room. There are two built in UBS ports to host printers or external storage, Four gigabit ports let you connect multiple computers or devices for ultra-fast network speeds and file sharing. Also has WPS/WPA2 encryption standards and preset security settings which get you up and running safely. One-touch Wi-Fi Protected Setup (WPS) securely connects multiple computers and devices with the push of a button. Setting up the router was pretty easy it already comes pre-configured with two wireless networks, one on each band, with their names and encryption keys printed on the label attached to the manual. To switch routers I had to call up my internet provider (Time Warner) tell them to change my modem which was a Motorola Surfer board with a built it wireless N, and add the Belkin Router, after that I had to install the installation CD into my computer which installed the program for the Belkin. 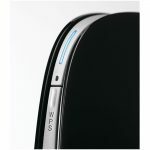 Belkin N750 DB Wireless Dual-Band N+ router offers fast 5GHz wireless speeds, Four gigabit ports let you connect multiple computers or devices for ultra-fast network speeds and file sharing. 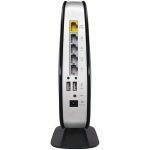 Now I’ve had my own problems with wireless routers I have a habit of leaving most if not all my devices on at one time, so I need a router that can handle more than four Wireless devices on at one time. The problem begins when I have the computer on downloading and Xbox360 on at the same time, when gaming online the wireless connection seems to go down I would lag and wind up dying (not good) in order to get a good single I would have to stop my download, even when I wasn’t downloading I still got a lousy single for the rest of my devices. Now my old router (Motorola Surferboard) said it would hold up to four devices, which wasn’t true it seem to only hold up the computer, the Xbox 360 and my Nintendo 3Ds, I wouldn’t be able to get online on my tablet or laptop. Belkin says it can hold up to four devices also but it actually held seven devices, I had my computer on (while downloading), Xbox 360 online no lag, Tablet, Nook Color, EVO Shift, Laptop and Nintendo 3Ds all in a different rooms had a great strong single, I was very impressed and happy. 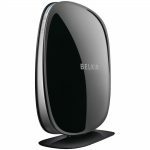 Overall I was very impressed with the Belkin N750 DB router, I had no problems with lagging, each of my devices had a great single, was able to download and play online with no problem. Gaming router usually go for $150 and up, The Belkin is $129.99 and backs it’s product with a two-year warranty, which is good for a router, as routers usually only come with a one-year warranty. Belkin’s toll-free phone support is available 24-7, or you can fill out a form at Belkin’s Web site for e-mail support. Its Web site also offers documentation, downloadable drivers, and FAQs. If you have nothing but high end wireless devices that need to be on at the same time then this router is for you. Next articleRIM Has Announced New Blackberry Devices….So!